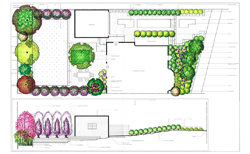 Interested In A New Landscape Design For Your Property? Now is a great time to hire a landscape designer! If you are considering a landscaping project for next spring, here are some reasons to start the design process now. Designers and contractors are in high demand in the spring. Many will be fully booked for spring before the annual landscaping season even starts. If your project requires permits, the permitting process generally takes a minimum of 3 months. By starting now, you can have your design completed, permits in place and contractor hired for a spring start. If you are looking at specialty materials, the turnaround time for delivery can be months. Your design must be finished and contractor hired before materials are ordered. If you are looking for specimen plants, the designer or contractor can work with the nursery once the design is completed, to source specimens over the winter. While not impossible, it is much easier for the designer to evaluate existing site conditions before they are covered in snow. Get a jump on spring with our landscape design services during the winter so it is ready for installation as soon as the ground thaws! Special Promotion – 20% off all spring design services booked before Jan 15th, 2014!